This article is about the Jiralhanae rank. For other uses see Stalker. Stalker is a specialist rank for Jiralhanae that are serving in the Covenant. They serve in covert roles in the Covenant, acting as spies or assassins. Stalkers are commonly seen acting as spies and bodyguards for Jiralhanae Chieftains, however they have a far more covert role in the Covenant. On the battlefield, they can function as spies and assassins. Jiralhanae Stalkers often use their active camouflage to flank and ambush unsuspecting hostile forces. They also use radar jammers to confuse enemies, before charging in with Type-52 Maulers to finish them off. During the Human-Covenant War in 2526 a select group of Stalkers called the Bloodstars were led by Sangheili First Blade Tel 'Szatulai from the Silent Shadow to hunt down the Demons. Towards the end of the war several Stalkers participated during the Battle of Earth and Battle of Installation 00. UNSC intel after the war on the Stalker corps was used by the Naphtali Contractor Corporation in the production of the MJOLNIR Powered Assault Armor (GEN2) Stalker variant. Stalkers are easily identified by their gray-colored armor, which possess integrated circuitry for cloaking in their power armor as well as their cyclops-like helmet with a bright red "eye" light. The Bloodstars' armor featured a dark red coloration to match the color of the Silent Shadow. They often use radar jammers to confuse their enemies, and make heavy use of Type-3 firebombs. Their main weapon seems to be the Type-25 plasma rifle, though they are occasionally armed with Type-25 Spikers or Type-52 Maulers. They use their active camouflage to protect their Chieftains. Occasionally, Jiralhanae Stalkers are equipped with radar jammers to disrupt enemy intel systems. Stalkers often employ plasma rifles, spikers, maulers and incendiary grenades in battle. The added advantage of their cloaking devices is balanced out by their below-average armor and health for a Jiralhanae (a feature they share with Sangheili Stealth operatives); a Jiralhanae Stalker is about on par with a Jiralhanae Minor in terms of shielding strength and health. On Heroic difficulty it takes 24 assault rifle bullets to kill a Stalker; 8 shots to bring down their shield, and an additional 16 shots to kill them. Once you spot the distinctive visual disruption caused by their active camouflage, use your weapon and melee them. They will be stunned and temporarily visible. Follow up with more melees until they're dead. It is advisable to only attempt this when there are no enemies nearby. Charging a Plasma Pistol and firing at the Jiralhanae's movement shimmers is guaranteed to strip their power armor, making them visible. Also, they will be temporarily visible when they throw their firebomb grenades. If the Stalker goes berserk, dodge the physical attacks and finish them off with a melee or headshot. On higher difficulties, it is advisable to use grenades, as they will blow their cover, and they can be quickly finished off by an automatic weapon. Watch for enemy fire and destroy any radar jammers you see deployed on the ground. Using the power drain will also strip their armor off, resulting in them being visible and having almost no shields. If the Stalker is standing on a glass floor, its feet should be visible. It is also effective to use a spiker or needler as the spikes are visible when stuck in the Jiralhanae. Defeating them is the easiest way to get incendiary grenades. In ODST, fighting Stalkers is much more straightforward. You are able to see them as yellow outlines in VISR mode, however, the outline color matches that of the terrain outlines, so they can theoretically still blend in if you don't watch yourself. Like all Jiralhanae in ODST, they also sport full energy shielding that can withstand twice as much damage from projectile weaponry compared with those in Halo 3. Besides these differences, it's mostly the same. One last thing is that they don't seem to know that you can see them, they may stand out in the open thinking that their camouflage prevents you from seeing them. In reality, it just makes them a big target. They are especially dangerous in ODST because of the generally dark conditions they are encountered in, though it becomes very easy to see them once VISR mode is toggled on. Todd McFarlane released an action figure of a Brute Stalker for its second series of action figures. It features two Spikers and a removable helmet. It is easier to spot a Brute Stalker by looking for its feet, as their cloaking reveals their feet more than any part of their body. On the John-117 Monument created for the Believe marketing campaign, all of the battling Jiralhanae minus the Chieftains are Brute Stalkers. On higher difficulties, a single Brute Stalker wielding a Brute Shot can be found at the second highest level of the Cartographer entrance on The Ark, just after defeating the Scarab. On the level The Covenant, the Brute Stalkers at the second tower guarding the Jiralhanae War Chieftain can be easily spotted by a glitch in which the player stands behind the glass wall right after arriving in the elevator which "cuts" their active camouflage in half where their bottom half is revealed and the rest of their body remains camouflaged. In Halo 3: ODST, cloaked Stalkers are visible in VISR in orange, which means that VISR systems label camouflaged objects as scenery. 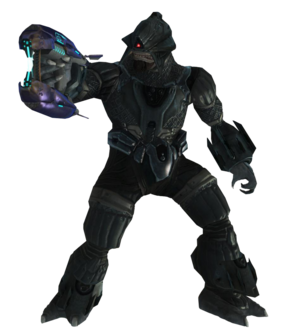 The Jiralhanae Stalker is featured in two Halo 3 levels: The Ark and The Covenant, as well as being prominently featured in Halo 3: ODST, where they roam the streets of New Mombasa in small groups. Concept art of the Stalker. A Jiralhanae Stalker, partially invisible. A trio of Jiralhanae Stalkers.